Through this blog you will come to know that as well as beer, I am also a massive fan of coffee so when you put the two together, I’m a very happy girl. 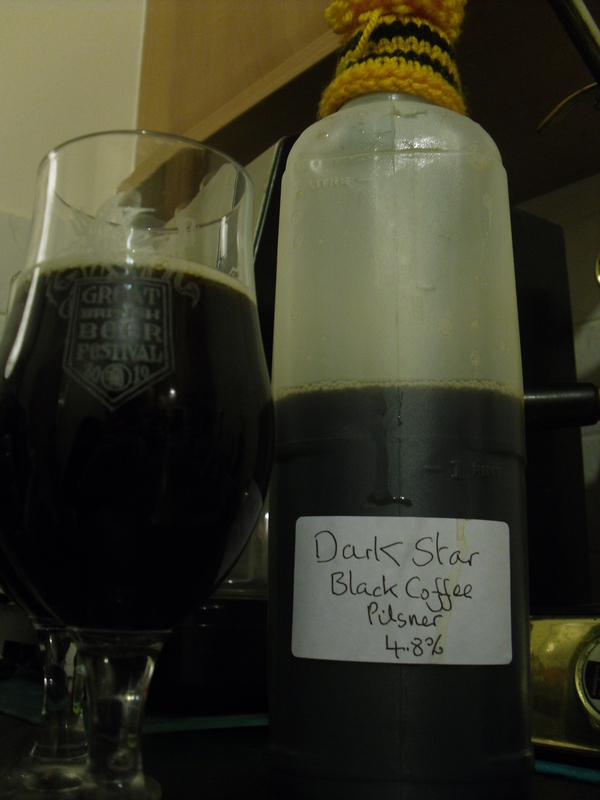 On the South Coast, we are very fortunate to have our own experts in this heavenly partnership, Dark Star. Their Espresso remains high on my list of favorite beers and it’s always easy to find bottled (at least in the South of England). My first experience of it was shamefully from out-of-date bottles being sold off in a local off-licence, but it was exceptional even then! Alongside their regular pemanent selection, they also do an imaginative selection of seasonal ales throughout the year, as well as monthly specials. February’s offering was a Black Coffee Pilsner, apparently inspired by a trip to the Czech Republic and the ‘intrinsic coffee flavour in the unfiltered dark Budvar.’ I was very excited to learn that my local ‘Bitter Virtue’ had procured a cask of the stuff this week. So excited that I have been checking the website obsessively twice a day to watch for the ‘coming soon’ to turn into ‘available now.’ Last night it finally came on so off I went, milk carton in hand to have it filled straight from the cask. 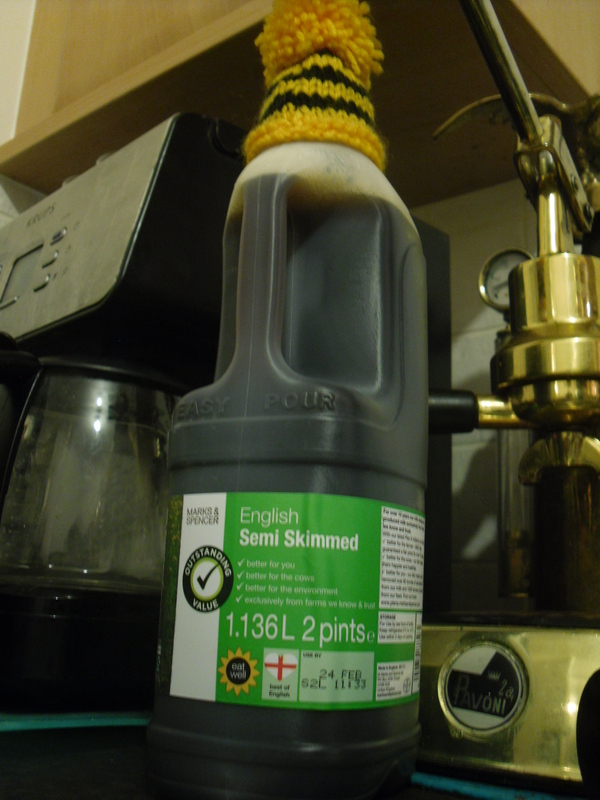 It’s a good job I did too – they only had a pint left after filling my carton! There’s something kind of fun about buying beer off the cask and carrying it home in a milk carton. It makes me feel like I’m recycling and getting a nice fresh beer at the same time. It also means I have to drink it all up on the same day (that’s what I tell myself). I had already been allowed a small taste in the shop so I was eager to get stuck in as soon as I got home. After a hard day of practically re-building my bike with muscles still burning from the kettle-bells session the night before, I needed a little pick-me-up and by gosh, that’s exactly what this is! In the glass, it’s such a deep brown it’s almost black. You could mistake it for black coffee! It even smells just like coffee but this ain’t no cheap instant. This is a chic, sophistocated dark-roasted espresso. There’s a hint of malt there just to remind you that this is actually a beer. The coffee flavour runs all the way through from start to finish with a delicate sweetness. According to Dark Star, this is down to the intrinsic coffee flavor of the imported Czech malts as well as the coffee beans added after fermentation. I was rather surprised at how refreshing this is for such a dark beer. It’s rich and full of flavor without being too strong. It definately shares a lot in common with the dark Czech lagers I have tried (Budvar & Bernard Dark).